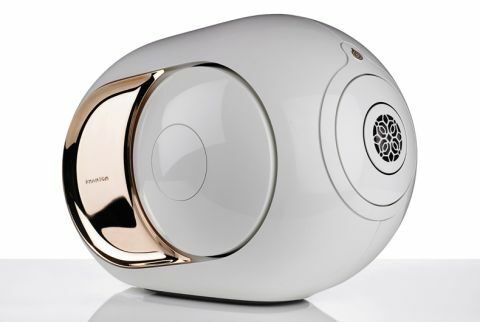 Devialet Gold Phantom review | What Hi-Fi? When we reviewed Devialet’s remarkable Silver Phantom wireless speaker at the end of 2015, we made many and various observations. One observation we failed to make, given the Silver Phantom is packing 3000W of power, was that it might be in any way short of grunt. So naturally enough Devialet is back with the Gold Phantom – it’s £500 more expensive than its Silver counterpart, and it’s got 50 per cent more power. That’s right, 4500W – which is good for a maximum 108dB/m sound pressure level. To put that into some sort of context, on paper at least, the Devialet Gold Phantom is capable of peak volume levels comparable to those of a modest aircraft. Which, in any domestic situation, ought to be ample. From the outside, very little has changed – the Gold Phantom shares the same enclosure as its Silver sibling, and for the second time in a year we find ourselves struggling to find comparisons for the Devialet’s striking looks. At 26cm tall and 25cm wide, it’s similarly proportioned to one of those clever Dyson vacuum cleaners, but at 11.4kg, not quite as easy to tow around the floor. On the shelf in the showroom (or on one of its elegant, additional-cost support options Tree, Treepod or, for wall-mounting, Gecko), only the 22-karat gold-plated covers on each side of the Gold Phantom set it apart from the Silver. Well, those and the extra £500 on the price ticket. There are some changes beneath the skin, though. The Texas Instruments DAC of lesser Phantoms has been replaced by a proprietary converter embedded in Devialet’s Analogue Digital Hybrid (ADH) technology. Branded ADHV2, it combines Class A and Class D amplification in an effort to maximise each technology’s inherent benefits while minimising its equally inherent shortcomings. The Gold Phantom tweeter is a titanium dome, a theoretical upgrade on the aluminium alternative used lower down the range. And, of course, there’s that whopping increase in peak power. Despite the DAC changes, the Gold Phantom tops out at the same maximum audio file resolution of 24-bit/192kHz as its Silver relative. Bandwidth is increased in both directions, though, down to 14Hz at the bottom end (where sound becomes not so much audible as physical) and 27kHz at the top (where sound is of much more use to a dog than to you). The Gold Phantom is designed as a wireless speaker, of course, and has both Bluetooth and wi-fi connectivity. But there is also a digital optical socket for legacy equipment, and an ethernet connection for those who value signal stability over decorative minimalism. And for the seriously monied, multiple Gold Phantoms can be configured to work as everything from a stereo pair to a surround-sound cinema package to as many as 24 discrete zones using the cost-option Dialog hub. Control of any or all of the Gold Phantoms in your particular set-up is via the Spark app for Android, iOS and Windows. At every turn, there are big numbers attached to the Gold Phantom experience. As well as those concerning price or power, there’s the 1.2 tons of pressure required to hermetically seal the Phantom cabinet and the 30kg of thrust force driving the lateral woofers (this configuration, whereby the hermetically sealed woofers function under tremendously high pressure, is – with no apparent sense of hyperbole by Devialet – called Heart Bass Implosion). For all its complicated architecture and crowd-pleasing numbers, the Gold Phantom functions as a wireless speaker in the most everyday sense: it’s simple to set up and equally painless to control. Its spherical, omnidirectional nature makes positioning it pretty straightforward (within the confines of its weight and size, of course), and getting the Devialet to a state of readiness is child’s play. If you think the Gold Phantom looks a little mysterious as an object, it becomes downright dramatic when it starts to do its thing. We start our investigations with a Tidal-via-LG G5 smartphone-derived listen to Nice Up The Function by Mr Scruff and Roots Manuva and, blimey, the Devialet is a sonic and visual handful right from the off. Sonically, it’s the low-frequency speed, punch and manoeuvrability that’s initially most impressive. This is a tune with a deep, stop/start and fast-moving bassline, and the Gold Phantom handles it with a nonchalance that speaks of unarguable authority and control – the out-and-out substance of the bass it generates is more commonly associated with great big drivers and even bigger cabinets. It hits startlingly hard, offers tremendous tonal and textural variation even down at the limits of its extension, and displays ballet-slipper poise to go with the iron-glove impact. Visually, the Devialet is like no other device outside the Phantom range. Accompanying the brick-cracking bass is a hectic flurry of movement from the side-firing woofers, the sort of alarmingly visual driver extension that in any other circumstances would have us leaping forwards to reduce the volume and prevent possibly terminal damage. But this is simply what the Gold Phantom does – it flaps its wings like a creature long since evolved beyond needing to fly, yet retaining a species memory of how it’s done. It’s a bit of visual theatre you simply don’t get with any other product. Elsewhere, it’s a similarly singular and confident story. Switching to a 24-bit/192kHz file of Leonard Cohen’s Slow shows off the Devialet’s midrange fidelity. The variable pitch of Cohen’s voice, who was 80 by the time of this recording, is reproduced with the sort of prodigious detail and fidelity that makes his approximate phrasing entirely endearing. The midrange overall is assertive enough to hold its own despite the low-end onslaught it’s riding above, but deft enough to reveal the minutiae of a singer’s palate-noises between lines of song. It’s grippy and poised, striking a reasonable balance between attack and subtlety. The move to a titanium tweeter means the Gold Phantom has greater reach, better management of transients and an altogether crisper high-frequency presentation than that of its more affordable siblings. The relentless ride cymbal and general percussive whirlwind of Elvis Costello & The Attractions’ charge through Nick Lowe’s (What’s So Funny ‘Bout) Peace, Love and Understanding is delivered faithfully, the Devialet’s remarkable ability to reproduce treble sounds with instant attack and equally accurate decay just adding to the overall propulsion of its presentation. For all of its forcefulness, though, the GP has the ability to handle the gossamer fragility of Nina Simone’s I Got It Bad (and That Ain’t Good) with sensitivity. Such a languidly intense recording is rather at odds with the Devialet’s general modus operandi, but it gives the song decent weight of emotion. The timing, and general sense of interplay between musicians, is admirable. Ultimately, though, it’s happiest when delivering a well-controlled storm of action. The company’s website describes the Gold Phantom as capable of “ultra-dense sound with physical impact” which – while hard to argue against – isn’t, we don’t think, an entirely positive thing. For all the fidelity demonstrated throughout the frequency range, there’s a lack of separation and space to the sound that makes the Devialet sound dense in the manner of fog – everything happens at speed, with an assertion that sometimes borders on aggression, and the small-ish soundstage as a consequence is not so much muddled as crowded. There’s the sense that Devialet has overachieved with the Gold Phantom’s bass response, almost to the extent the rest of the frequency range has been supercharged to match. So it’s not perfect. But then very little in the world of consumer electronics is, and Devialet’s achievements with the Gold Phantom, in engineering and packaging terms alone, are mighty. Add eye-catching numbers, eye-popping visual impact and ear-grabbing sound, and it’s obvious this is a product that will seduce many – even at such a premium price. It’s certainly worth seeing.